The most sacred place for Poles in Lvov today. 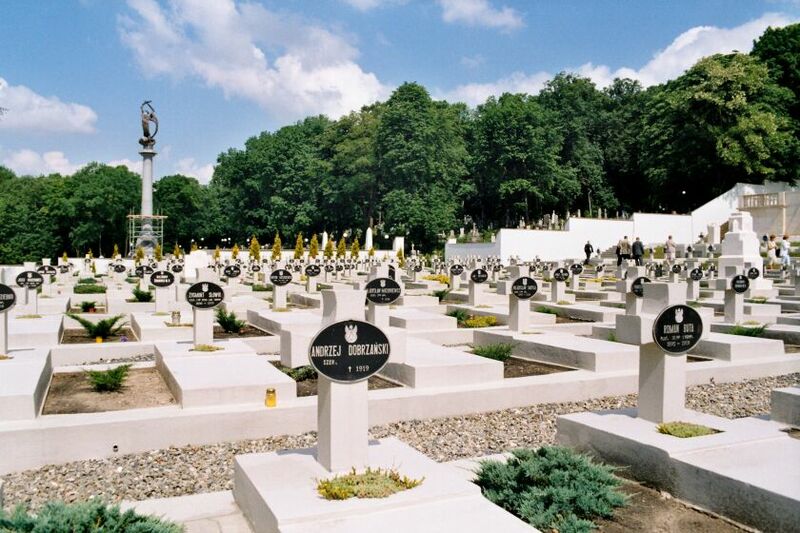 The Cemetary of Lvov Eaglets - a must for all Polish tourists who visit Lvov. The cemetary was purposefully badly damaged by Ukrainians in communist times, but when the system collapsed, the mutual Polish - Ukrainian agreements settled the problem and the cemetary was reconstructed, in a little different form. The view from 1971. The main building was used as a storage house. 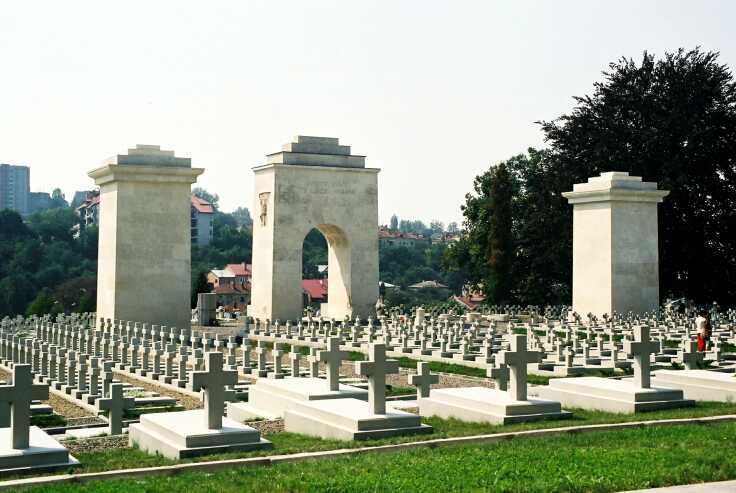 The Cemetery of the Defenders of Lwów (Polish: Cmentarz Obrońców Lwowa, Cmentarz Orląt, Cemetery of Eaglets, Orlat Cemetery) is a memorial and a burial place for the Poles and their allies who died in Lviv (Polish: Lwów) during the hostilities of the Polish-Ukrainian War and Polish-Soviet War between 1918 and 1920. The complex is a part of the city's historic Lychakiv Cemetery. There are about 3000 graves in that part of the cemetery; some from the Lwów Eaglets young militia volunteers, after whom that part of the cemetery is named. It was one of the most famous necropolises of the interwar Poland. It was neglected after World War II by the Ukrainian Soviet Socialist Republic, and at one time damaged with a bulldozer. Since the fall of communism, the cemetery has seen constant rebuilding and refurbishment and continues to be one of the principal tourist attractions of Lviv. In 1918–1919, Poles and Ukrainians fought over the territory of Eastern Galicia that included Lviv; with Poland defeating the Western Ukrainian People's Republic. A year later, another war, between Poland and the Russian SFSR, was fought around the city. In the aftermath, the city ended up being part of interwar Poland, and the Polish authorities decided to construct a memorial to the Poles and their allies who died in the 1918–1920 hostilities in that region. The necropolis complex was designed by Rudolf Indruch, an architecture student from the Lviv Polytechnic whose project won the competition. The most visible element was a domed chapel which towers over the tombs underneath. Exhumed remains of the 72 fighters were put in catacombs located between the chapel and the tombs. In addition to Polish fighters, this part of the cemetery also has graves and monuments to American (pilots from the Kościuszko Squadron) and French volunteers who fought on the Polish side, two monuments were dedicated to those Polish foreign allies. 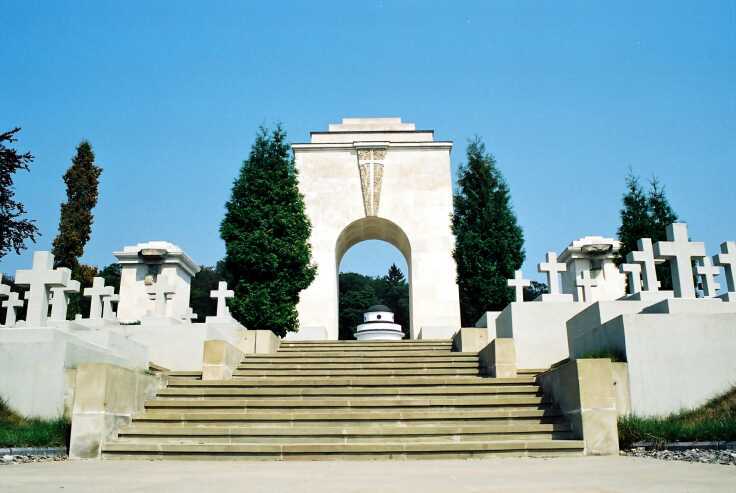 Underneath, an inscription "Mortui sunt ut liberi vivamus" ("They died so we could live free") was engraved on a semi-circular colonnade monument. A triumphal arch was flanked by two stone lions. The necropolis was never finished; its construction continued until the outbreak of the Second World War. Out of almost 3,000 tombs, 300 were dedicated to the Eaglets, as the young Polish defenders of the city from 1918 are known. 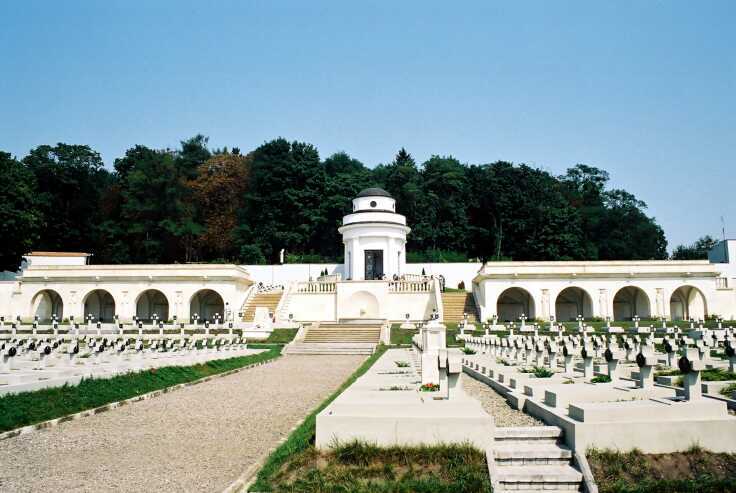 In 1925 the ashes of one of the unknown defenders of Lwów were transferred to the Tomb of the Unknown Soldier in Warsaw. After the Soviet invasion of Poland and the events of World War II, the city became part of Soviet Ukraine, and the Polish historical monuments located at the cemetery were devastated or neglected. The stone lions, the columnade, the monuments to foreign troops were removed. Up to 1971 many of the sculptures were destroyed; the cemetery of Lviv Eaglets was completely destroyed and turned into a truck depot. Soviets attempted to destroy the triumphal arch with tanks. In the 1970s, the majority of the tombs were razed with bulldozers. The Lviv Eaglets section was, however, not reopened for several decades, as the fact that many of the people buried there fought on the Polish side against the Ukrainians during the Polish-Ukrainian War generated some controversy. The issue has resurfaced several times in the Polish-Ukrainian relations; however, in 1989 the reconstruction works have begun, carried by local Polonia and Polish workers working temporarily in Lviv. 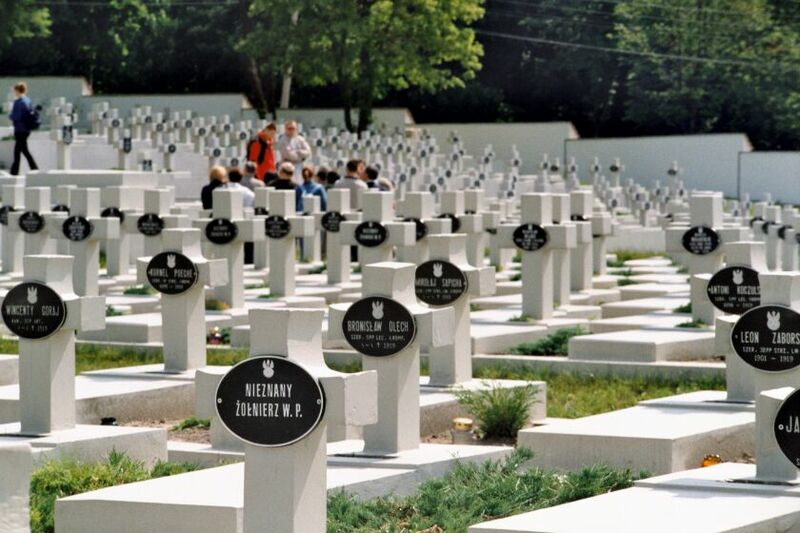 Eventually the Cemetery of the Defenders of Lviv was reopened on 24 June 2005 when the Lviv City Council, which initially resisted the opening, eventually changed its mind, following Polish support for Ukraine's Orange Revolution (2004). President of Poland Aleksander Kwaśniewski and President of Ukraine Viktor Yushchenko, who attended the opening ceremony, agreed that the reconstruction and official opening represents a major improvement in Polish-Ukrainian relations. From time to time Lvov council introduces some restrictions within the cemetery. E.g., recently they screened lion sculptures with plywood, claiming they are the symbol of Polish aggression against Ukraine. 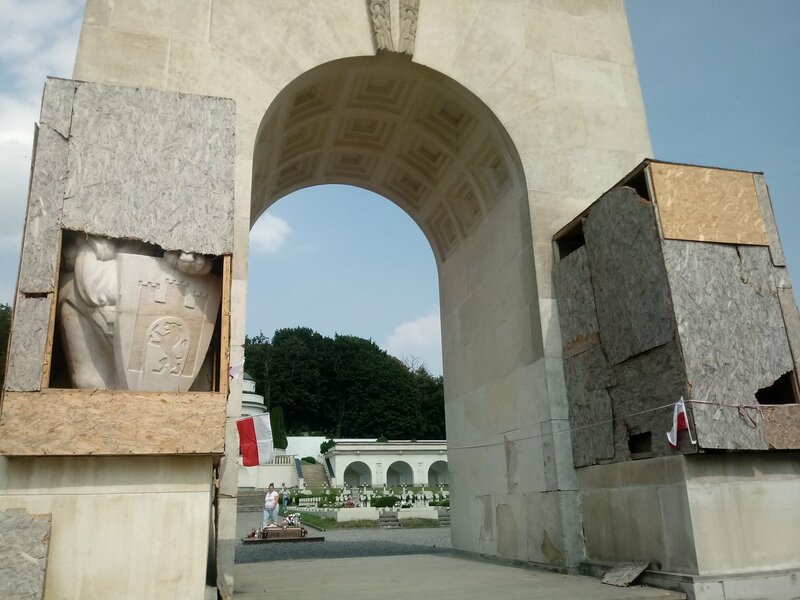 The plywood casing of two Lviv Lions that guard the Polish Lviv Eaglets’ military cemetery was damaged by four individuals on Sunday. Mykhailo Nahay – the head of the Lychakiv Cemetery, which also encompasses the Lviv Eaglets’ military cemetery, informed about the incident, saying that the damage is minimal as the perpetrators managed to break off only a 35 sq cm of the casing. Another incident of similar type took part in the night of December 4 and 5; however, that time, the perpetrators were neither revealed nor caught. Earlier on November 22, three Polish students were stopped from firing flares, an attempt that was penalised by a Ukrainian court with a PLN 1,200 (EUR 280) fine. In July, Lviv’s court fined a Polish national who had damaged the plywood casing and later said he had done that to “liberate” the Lviv Lions. 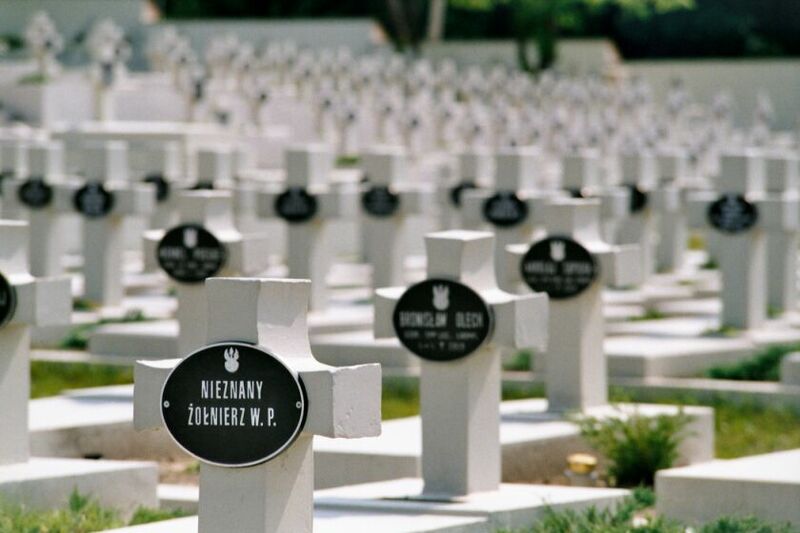 The incidents were condemned by the Polish Care for Military Graves in Lviv Association (TOGWwL), that deems the cemetery not a place for political demonstrations and stresses that incidents of this kind undermine Lviv’s Poles relations with the Ukrainian authorities. According to the TOGWwL, the Lions are encased because they await renovation. “The Lviv Eaglets’ Cemetery is a place of prayer and reconciliation between the peoples of Poland and Ukraine,” stated the Association. Lviv was a Polish city from the 14th century until 1772, when it became a part of the Austrian Empire, seized during the First Partition of Poland, carried out jointly with the Russian empire and Prussia. 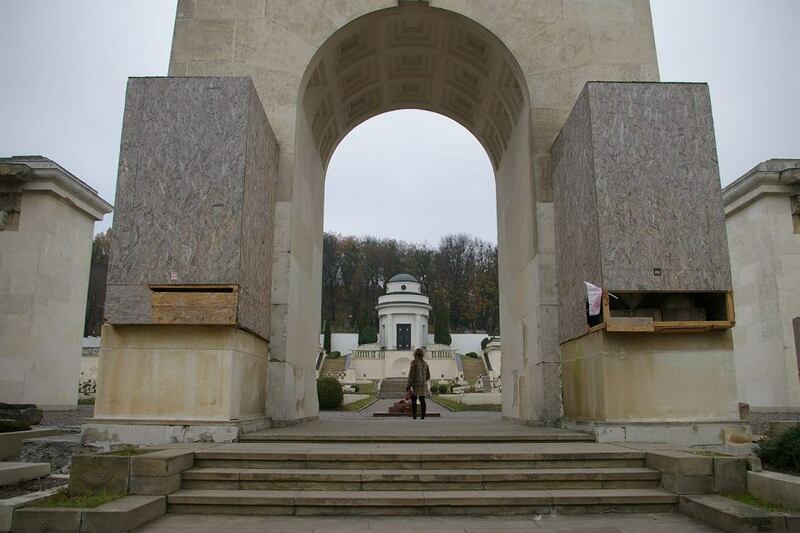 The dramatic events of WWI revived hopes Lviv might return to Poland. However, on November 1, 1918, following the collapse of the Austro-Hungarian Empire, the establishment of the West Ukrainian People's Republic was proclaimed, and the Ukrainian units of the Austro-Hungarian army took control of the city. The Polish citizens of Lviv opposed the idea of the city being part of a newborn Ukraine, which led to Polish-Ukrainian battles later known in Polish history as “the Defense of Lviv.” To this day, around 3,000 Polish teenagers, who fought for the city in 1918-1919 and in 1920 during the Polish-Bolshevik War, are buried in the Lviv Eaglets’ cemetery. After WWII, Lviv became part of the USSR. The Lion sculptures were removed by the Soviet authorities from the cemetery in 1971. Following the Soviet Union’s collapse, Lviv became part of the newly established state of Ukraine on August 24, 1991. It was only in 2015 that the Lions returned to the Lviv Eaglets’ cemetery thanks to the endeavour of the Cultural Heritage Foundation and the TOGWwL.